It's the best way to ensure reliability for your computer's activity with a very powerful antivirus engine, considered the best product of its kind on the market. Kaspersky Anti-Virus 2019 besides being able to eliminate even the latest versions of viruses, Trojans and worms it also, provides email protection and instant messages, ensures a secure Internet browsing and even more, all this without slowing down your PC. - Ensures a high level of protection, fighting against viruses, Trojans, worms and spyware, locking adware, and also provides phishing and keylogers protection. - It supervises your email and instant messages. - Offers scan options : Full Scan (scans the entire system), Vulnerability Scan (announces you of the existence of threats) and Critical Areas Scan (scans the files that open along with windows), this scanning options can be automated or scheduled and besides that, Kaspersky scans your PC when it's idle (for a low use of your system performance). - Browsing protection: detects malicious sites and it blocks your access to them, as well it checks out your downloads. - Guarantees your data security, careless of identity theft. 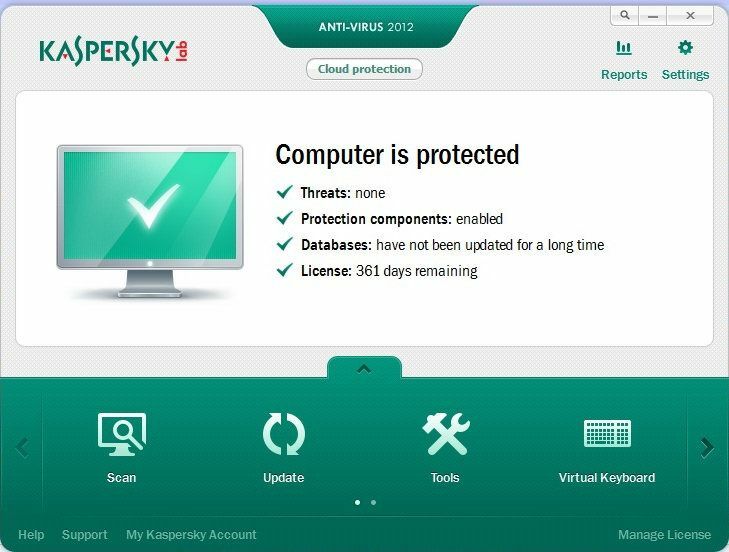 It offers new advanced technology that permit to run a variety of applications on idle PC (application such as automatic update and scanning), likewise Kaspersky can be installed on a compromised computer. Another novelty is Rescue CD feature, which cleans up your PC after malicious software assault. It’s a trial software, so you can use it for 30 days.